Hey beautifuls, so its November and it is the Blogversary month of Beauty & Beyond. And we have Diwali in just a weeks time. So, isnt it time for celebrations? 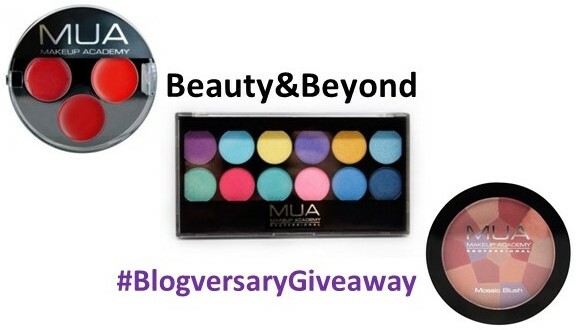 We want to thank all of you with a #BlogversaryGiveaway, where one winner wins a MUA Makeup Academy Hamper. Excited? Well it is easy to take part. Follow the below mentioned rules and participate. 7. Mention your name, city and email id in the comments section below. Additional points for those who follow us on GFC here and who share about the giveaway the most. (Please tag us and add #BlogversaryGiveaway ). There may be surprises also. So, try to be more active on the blog and on all the Social Media Platforms of Beauty & Beyond. The More Shout Outs, the more chances of winning. So what are you waiting for? The giveaway starts today and runs till 7th December, 2015. Again, reminding there may be surprises!! Giveaway open for Indian residents only.